Lovely three bedroom villa with private pool on its own in a quiet countryside location. The villa sleeps six people comfortably and only a 25-minute drive from Faro airport and only approximately 20 minutes from Spain. Three double sized bedrooms, master bed having king sized bed and en-suite shower-room, family bathroom, fully fitted modern kitchen, dining /sitting room with internet TV and DVD player. Outside there are three terraces two secluded upstairs and one around the pool area where there is also a large brick built barbecue with shaded dining area. The swimming pool measures 9m by 5m & benefits from integral steps, making it suitable for children. The villa is approximately 5 kilometres from the medieval town of Tavira (with it's 37 Churches !) and local beaches. Three 18-hole golf courses are only 10 - 15 minutes drive away and offer superb golf in unspoilt surroundings. Tavira: Tavira is a very old picturesque town steeped in history with lots to see a castle, churches, monuments, Roman and Moorish architecture. It has a new fish market where you can buy fresh fish, salads, meats etc daily, except Sundays. Tavira has numerous bars and restaurants, but it is also worth visiting the surrounding villages and towns for the local ambience as well. There are numerous beaches all within 5-10 minutes drive, although a car is not essential, it is advisable. Golfers will enjoy the four local golf courses all within 10 to 15 minutes drive from Casa Margarida. Other courses such as Castro Marim & Quinta da Vale (designed by Seve Ballesteros) just outside Vila Real on the border with Spain, are slightly further away but are still within 30 minutes drive. If you have any questions regarding golf, please feel free to call/email Simon. Weather: Fact, did you know that the Algarve enjoys the mildest, sunniest winters in mainland Europe, daytime temperatures average 16 degrees centigrade (61F). Escape the crowds associated with summer season and enjoy lovely warm sunny days during the winter months - don’t forget your T-shirt, shorts and sun cream!! I'm a 50 year old accountant who bought Casa Margarida using an inheritance. I chose the villa because of the unique combination of locality to Tavira, with all it's cobbled streets & atmospheric backstreet restaurants....local beaches....& motorway junction. And yet it is totally silent due to being set down in a little valley. New broadband service installed June 2014. Nearest restaurant / bar a few minutes walk is the very popular Luis do Prego. Maid service and linen change weekly, beach towels NOT provided. Electric heaters for winter months, electric fans for summer months. Pool cleaned weekly. Swimming pool 9Mx5M with internal steps and shallow and deep end. 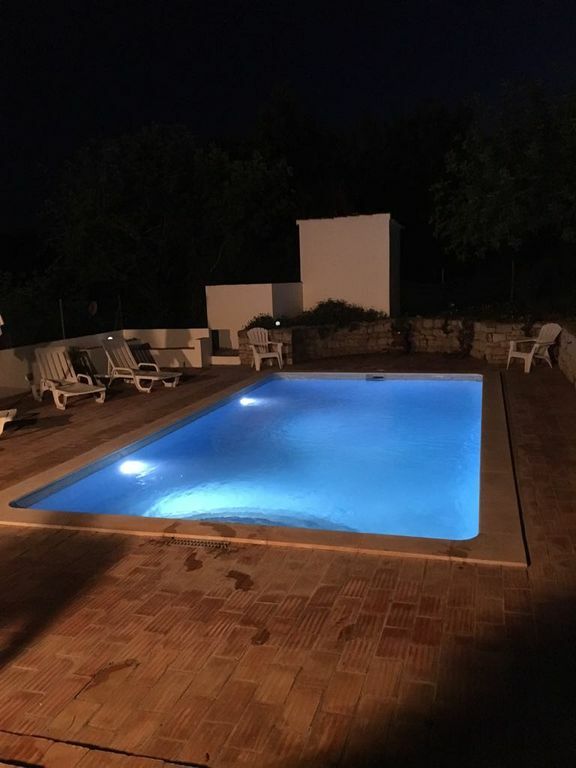 We had a wonderful stay in this private 3 bedroom villa near Tavira. Set in peaceful surroundings but with easy access to Tavira and surrounding areas. The villa is very spacious, well equipped and the pool is lovely. Tavira is a very pretty town and all the local beaches are stunning, and there are other pretty towns to visit too. We are out at many restaurants recommended by Smartavillas who look after the house and all were fantastic and cheap! Everyone was so friendly and helpful. We had such a lovely time, we didn't want to come home! We stayed for a week in early March 2018. The property itself is certainly quiet and also well located both for the nearest town of Tavira and also the surrounding sights. It's a spacious place and will easily sleep six in the three bedrooms, the living areas and kitchen are also large and airy. When the weather is warm enough it also boosts a lovely roof terrace which would be great for evening drinks and dinner overlooking the unspoilt countryside. 6 of us (3 couples) stayed comfortably in this spacious villa. Although in a remote area of Tavira, the town is only a 10 minute drive away. A never ending supply of hot water meant we didn't worry about being last in the shower! Modern kitchen facilities for self catering. Good pool, although a bit cold! Clean and well maintained and the manager was very friendly and attentive. The local guide provided was very accurate. D'gusta Restaurant was my favourite, especially the Chorizo. Also look out for Dom and Flo Creperie in the centre. Banana Split Crepe was delicious. Also, there is a local restaurant and bar only a 3-4 minute walk which was worth a visit. Ideal for families. I would say 6 is maximum for comfort. Make sure you visit Cabana Beach and take the ferry!! Relaxing, well equip and lovely pool! Really impressed with Casa Margarida. The photos on the website don't do it justice. Lovely villa, clean and well equipped. The pool is superb, we made use of the pool and large patio area every day, so lovely and such a suntrap, not overlooked by anyone which we loved. Views from the villa are stunning, especially from the large roof terrace. We are a family of 6, plenty of space for us, property clean, tidy and perfect for our needs. Local to Tavira which is beautiful and a short drive to shops, supermarket, beach and restaurants. Would definitely recommend and use again. Thank you so much Simon! We have just returned from 2 most relaxing weeks at Casa Margarida. The villa is very easily reached from Faro Airport. It took us about 30 mins. The house is on a quiet road next to a peach orchard. The house itself is large and airy and very well equipped. We loved the various seating areas. Breakfast was always out the front, lunch by the pool, dinner on the top terrace and then stargazing with a glass of wine on the second roof terrace. The pool was a good size and brilliant fun for all. The outside space was perfect for us. Tavira was a 15 minute drive from the villa and has everything you need for food shopping (Lidl, Aldi and two Portuguese supermarkets) as well as the municipal market, which was our favourite place for amazing fruit and veg. We only ate out once (daughter has a nut allergy) at the restaurant down the road. Lots of big meat and fish dishes at great prices. Nothing fancy, but good enough. For days out we went on a dolphin tour from Tavira, which was fantastic with lots of dolphins swimming around our boat, a visit to an olive grove at Monterosa, a cork factory, a trip to barril beach, which we enjoyed too. Didn't fancy queueing for the ferry, so we went there instead. This beach has a carpark near a bridge, where you can cross the river on foot and then catch a little train to the beach or just take a little walk. We had two really hot weeks, so mostly enjoyed chilling by the pool. The booking process and information provided by Simon the owner was great. Thank you for a fantastic time. We are missing Portugal already. Golf: Ideally suited for several local golf courses including Benamor, Castro Marim, Quinta Da Cima, Quinta Da Ria, Jack Nicklaus's Monte Rei as well as being only 30 minutes from all of the Western Algarve courses. The newest local course in Quinta da Vale designed by Seve Ballesteros...but it's tough ! Mobile phones normally have excellent reception. Baby cots can be provided at extra cost.